.... and I have to go to work today, so this is a scheduled post. I hope you are all well at the beginning of the first full week in October - how many days till Christmas? This is my third week as guest designer for Pear Tree Designs. I hope you have been able to go over and have a look at their challenge blog and take part in these challenges. 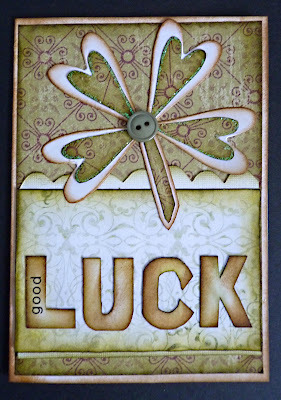 The challenge theme today is 'Good Luck' and while I was away last week I made a few cards and this is one of them. I remember seeing a card with a four leaf clover on it made with hearts and thought this would be a great idea to use. The hearts are cut using a provo craft die and as you an see I used DIs and stickles on them. 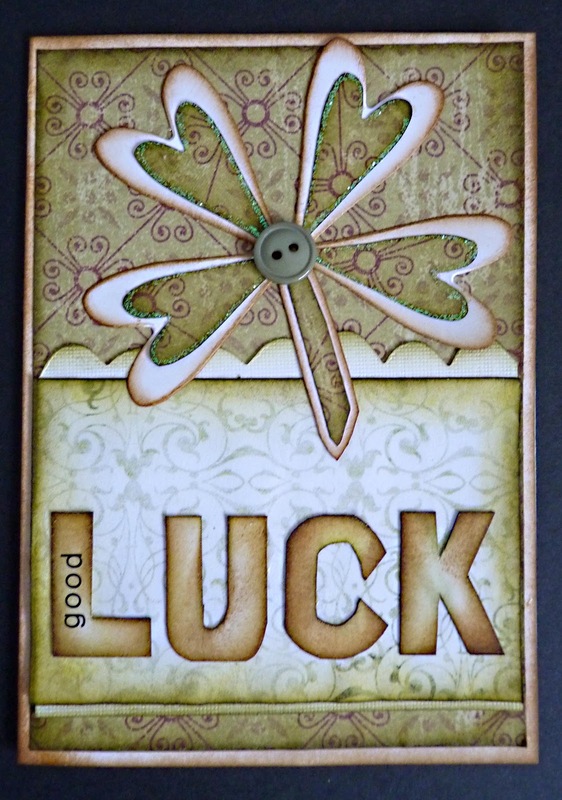 I didn't have any letter diecuts with me so I actually drew 'luck' by hand and cut them out and used rub-on letters for 'good'. I used a TH 'on the edge' scallop die and papers from my box of bits. Have a great day and thankyou for stopping by to see what I have been doing. If you have left me a comment, thankyou, I love looking to see who has popped in. I thought I had it bad when I took my laptop on vacation, but to actually make up cards from scratch...I do take images with some pencils and markers, but don't get a lot accomplished. Cute card Brenda, and you did very good on the letters! My Christmas countdown ticker tells me its 81 days till Christmas!!!!! I love your good luck card and don't feel that you are too sad I shall be making cards and ATC's (maybe even the odd layout) whilst I'm away too!! Mind you I would feel seriously craft deprived after five weeks. WOW, you drew those letters!?!?! Great job!! Love the button in the middle of the shamrock!! Fantastic card. Thanks for joining us this week and "using your stash" at Paper Sundae's. Morning Brenda, I am a bit behind with the commenting but so pleased I popped by to see your latest creations as they are so adorable. Great card Brenda those hearts look fab, bet they would make a nice flower too they are a lovely shape, are they die cut? or punched? I really like the shape of them. I love the simplicity and the vintage colours. Thank you for joining us at Ooh La La. I like those soft shades and muted colours. Hi Brenda, this is one stunning card and appeals to me greatly especially as it has the vintage look which I adore. Beautiful work as always Brenda! Thank you for visitting and always leaving such lovely messages. Thank you for playing with "Paper Sundaes" hope to see you again. Real Cute ! Thanks for playing in our Paper Sundaes Challenge!